This article is about the ballad opera. For the Scottish rock band, see Beggars Opera (band). For the film, see The Beggar's Opera (film). The Beggar's Opera premiered at the Lincoln's Inn Fields Theatre on 29 January 1728 and ran for 62 consecutive performances, the second longest run in theatre history up to that time (after 146 performances of Robert Cambert's Pomone in Paris in 1671). The work became Gay's greatest success and has been played ever since; it has been called "the most popular play of the eighteenth century." In 1920, The Beggar's Opera began an astonishing revival run of 1,463 performances at the Lyric Theatre in Hammersmith, London, which was one of the longest runs in history for any piece of musical theatre at that time. The piece satirised Italian opera, which had become popular in London. According to The New York Times: "Gay wrote the work more as an anti-opera than an opera, one of its attractions to its 18th-century London public being its lampooning of the Italian opera style and the English public's fascination with it." Instead of the grand music and themes of opera, the work uses familiar tunes and characters that were ordinary people. Some of the songs were by opera composers like Handel, but only the most popular of these were used. The audience could hum along with the music and identify with the characters. The story satirised politics, poverty and injustice, focusing on the theme of corruption at all levels of society. Lavinia Fenton, the first Polly Peachum, became an overnight success. Her pictures were in great demand, verses were written to her and books published about her. After appearing in several comedies, and then in numerous repetitions of The Beggars Opera, she ran away with her married lover, Charles Powlett, 3rd Duke of Bolton. Elisabeth Hauptmann (with Bertolt Brecht) and Kurt Weill adapted the opera into Die Dreigroschenoper (The Threepenny Opera) in 1928, sticking closely to the original plot and characters but with a new libretto and mostly new music. Peachum, a fence and thief-catcher, justifies his actions. Mrs Peachum, overhearing her husband's blacklisting of unproductive thieves, protests regarding one of them: Bob Booty (the nickname of Robert Walpole). The Peachums discover that Polly, their daughter, has secretly married Macheath, the famous highwayman, who is Peachum's principal client. Upset to learn they will no longer be able to use Polly in their business, Peachum and his wife ask how Polly will support such a husband "in Gaming, Drinking and Whoring." Nevertheless, they conclude that the match may be more profitable to the Peachums if the husband can be killed for his money. They leave to carry out this errand. However, Polly has hidden Macheath. Macheath goes to a tavern where he is surrounded by women of dubious virtue who, despite their class, compete in displaying perfect drawing-room manners, although the subject of their conversation is their success in picking pockets and shoplifting. 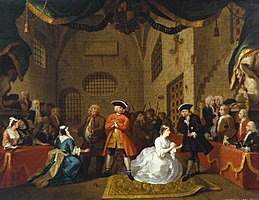 Macheath discovers, too late, that two of them (Jenny Diver, Suky Tawdry) have contracted with Peachum to capture him, and he becomes a prisoner in Newgate prison. The prison is run by Peachum's associate, the corrupt jailer Lockit. His daughter, Lucy Lockit, has the opportunity to scold Macheath for having agreed to marry her and then broken this promise. She tells him that to see him tortured would give her pleasure. Macheath pacifies her, but Polly arrives and claims him as her husband. Macheath tells Lucy that Polly is crazy. Lucy helps Macheath to escape by stealing her father's keys. Her father learns of Macheath's promise to marry her and worries that if Macheath is recaptured and hanged, his fortune might be subject to Peachum's claims. Lockit and Peachum discover Macheath's hiding place. They decide to split his fortune. Meanwhile, Polly visits Lucy to try to reach an agreement, but Lucy tries to poison her. Polly narrowly avoids the poisoned drink, and the two girls find out that Macheath has been recaptured owing to the inebriated Mrs Diana Trapes. They plead with their fathers for Macheath's life. However, Macheath now finds that four more pregnant women each claim him as their husband. He declares that he is ready to be hanged. The narrator (the Beggar), notes that although in a properly moral ending Macheath and the other villains would be hanged, the audience demands a happy ending, and so Macheath is reprieved, and all are invited to a dance of celebration, to celebrate his wedding to Polly. It will, I know, be said, by these libertine Stage-Players, that the Satire is general; and that it discovers a Consciousness of Guilt for any particular Man to apply it to Himself. But they seem to forget that there are such things as Innuendo's (a never-failing Method of explaining Libels)… Nay the very Title of this Piece and the principal Character, which is that of a Highwayman, sufficiently discover the mischievous Design of it; since by this Character every Body will understand One, who makes it his Business arbitrarily to levy and collect Money on the People for his own Use, and of which he always dreads to give an Account – Is not this squinting with a vengeance, and wounding Persons in Authority through the Sides of a common Malefactor? The commentator notes the Beggar's last remark: "That the lower People have their Vices in a Degree as well as the Rich, and are punished for them," implying that rich People are not so punished. Criticism of Gay's opera continued long after its publication. In 1776, John Hawkins wrote in his History of Music that due to the opera's popularity, "Rapine and violence have been gradually increasing" solely because the rising generation of young men desired to imitate the character Macheath. Hawkins blamed Gay for tempting these men with "the charms of idleness and criminal pleasure," which Hawkins saw Macheath as representing and glorifying. The political satire, however, was even more pointed in Polly than in The Beggar's Opera, with the result that Prime Minister Robert Walpole leaned on the Lord Chamberlain to have it banned, and it was not performed until fifty years later. As was typical practice of the time in London, a commemorative "score" of the entire opera was assembled and published quickly. As was common, this consisted of the fully arranged overture followed by the melodies of the 69 songs, supported by only the simplest bass accompaniments. There are no indications of dance music, accompanying instrumental figures or the like, except in three instances: Lucy's "Is Then His Fate Decree'd Sir" – one measure of descending scale marked "Viol." –; Trape's "In the Days of My Youth", in which the "fa la la chorus is written as "viol. "; and the final reprieve dance, Macheath's "Thus I Stand Like A Turk", which includes two sections of 16 measures of "dance" marked "viol." (See the 1729 score, formerly published by Dover). The absence of the original performing parts has allowed producers and arrangers free rein. The tradition of personalised arrangements, dating back at least as far as Thomas Arne's later 18th century arrangements, continues today, running the gamut of musical styles from Romantic to Baroque: Austin, Britten, Sargent, Bonynge, Dobin and other conductors have each imbued the songs with a personal stamp, highlighting different aspects of characterisation. Following is a list of some of the most highly regarded 20th-century arrangements and settings of the opera. In 1920, the baritone Frederic Austin newly arranged the music (and also sang the role of Peachum) for the long-running production (1,463 performances) at the Lyric Theatre, Hammersmith. The Irish baritone Frederick Ranalow sang the role of Captain Macheath in every performance. In 1955 this version was recorded by conductor Sir Malcolm Sargent with John Cameron as Macheath and Monica Sinclair as Lucy. In 1928, on the 200th anniversary of the original production, Bertolt Brecht (words) and Kurt Weill (music) created a popular new musical adaptation of the work in Germany entitled Die Dreigroschenoper (The Threepenny Opera). In this work, the original plot is followed fairly closely (although the time is brought forward over a hundred years) but the music is almost all new. In 1946, John La Touche (book and lyrics) and Duke Ellington (music) created another musical adaptation of the work for Broadway entitled Beggar's Holiday. An updated rendition of the story focused on a corrupt world inhabited by rakish Mobsters, raffish Madams and their dissolute whores, panhandlers and street people. In 1948, Benjamin Britten created an adaptation with new harmonisations and arrangements of pre-existing tunes. Additional dialogue was written by the producer, Tyrone Guthrie. Peter Pears was the first singer of Macheath. It was dedicated to James Haldane Lawrie, who would go on to chair the English Opera Group. The opera was made into a film version in 1953, and starred Laurence Olivier as Captain Macheath. In 1975, Czech playwright (and future president) Václav Havel created a non-musical adaptation. In 1977, the Nigerian Nobel Prize-winning playwright and dramatist Wole Soyinka wrote, produced and directed Opera Wonyosi (publ. 1981), an adaptation of both John Gay's The Beggar's Opera and Bertolt Brecht's The Threepenny Opera; most of his characters as well as some of the arias are from the two earlier plays. In 1978, the Brazilian singer-songwriter Chico Buarque wrote Ópera do Malandro (1978), an adaptation of both John Gay's The Beggar's Opera and Bertolt Brecht's The Threepenny Opera, with new songs and set in 1940's Rio de Janeiro,which was later adapted as a film by director Ruy Guerra. In 1981 Richard Bonynge and Douglas Gamley arranged a new edition for The Australian Opera (now Opera Australia). It was recorded the same year with Joan Sutherland, Kiri Te Kanawa, James Morris and Angela Lansbury. The opera was adapted for BBC television in 1983. This production was directed by Jonathan Miller and starred Roger Daltrey in the role of Macheath, Stratford Johns as Peachum, Gary Tibbs as Filch, and Bob Hoskins as the Beggar. The "happy" ending was changed so that Macheath is hanged instead of being reprieved. In 1984 in the play (and later film) A Chorus of Disapproval by Alan Ayckbourn, an amateur production of The Beggar's Opera is a major plot driver and excerpts are performed. In 1990 Jonathan Dobin created his period-styled performing edition for the Ten Ten Players (now Theatre 2020) and it has since been performed at a venues throughout the United States. This edition is based on the 1728 printed edition and includes the full overture as detailed by Pepusch and fleshes out all of the remaining 69 airs and dances of the original 18th century production. In 1998, the all female Japanese troupe, Takarazuka Revue, produced an adaptation titled Speakeasy. The play was Maya Miki's retirement play. In 2008 the Sydney Theatre Company of Australia and Out of Joint Theatre Company co-produced a version entitled The Convict's Opera written by Stephen Jeffreys and directed by Max Stafford-Clark. This version is set aboard a convict ship bound for New South Wales, where convicts are putting on a version of The Beggar's Opera. The lives of the convicts partly mirror their characters in The Beggars' Opera, and modern popular songs are performed throughout the piece. The Convict's Opera began touring the UK in early 2009. The theatre company Vanishing Point created a modern production of The Beggar's Opera in 2009 for The Royal Lyceum Theatre and Belgrade Theatre, Coventry, set in a near-future apocalypse world. It features music from A Band Called Quinn. The original opera was performed in an 18th-century setting at the Regent's Park Open Air Theatre in summer 2011 in a production directed by Lucy Bailey. ^ "Bibliomania: Free Online Literature and Study Guides". bibliomania.com. Archived from the original on 21 December 2010. ^ Carlson, Marvin (1975). "A Fresh Look at Hogarth's 'Beggar's Opera'". Educational Theatre Journal. JSTOR 3206338. ^ Although when The Beggar's Opera opened in 1920, Chu Chin Chow had been running since 1916, receiving 2,238 performances up to 1921. Source: "Long runs in London". World Theatres. Archived from the original on 23 June 2016. Retrieved 19 June 2016. ^ a b Richardson, John. "John Gay, The Beggar's Opera, and forms of resistance." Eighteenth-Century Life. 24.3 (2000): 19–30. ^ Sugden, John and Philip. The Thief of Hearts: Claude Duval and the Gentleman Highwayman in Fact and Fiction. Arnside, Cumbria: Forty Steps, 2015. ISBN 978-0-9934183-0-3. ^ Moore, Lucy (1997). The Thieves' Opera. p. 227. ISBN 0-670-87215-6. ^ His dark song of self-justification is the only song that appears in both The Beggar's Opera and The Threepenny Opera (as Morgenchoral des Peachum). The lyrics in the latter version are very different, but the melody and the position of the song in the libretto are retained. ^ "The first production." The Beggar's Opera. Archived 4 March 2016 at the Wayback Machine Accessed 10 August 2011. ^ Guerinot & Jilg, 87–88. ^ Guerinot & Jilg, 89. ^ Kidson, Frank. "The Beggar's Opera" The Musical Times 1 January 1921: 18–19. ^ "Britten Thematic Catalogue – BTC1020 – THE BEGGAR'S OPERA". www.brittenproject.org. Archived from the original on 3 April 2016. Retrieved 19 March 2016. ^ Britten, Benjamin; Mitchell, Donald; Reed, Philip; Cooke, Mervyn (1991-01-01). Letters from a Life: 1952–1957. Boydell Press. ISBN 978-1-84383-382-6. ^ Michael Billington (30 June 2011). "Review – The Beggar's Opera". The Guardian. Archived from the original on 1 January 2017. Wikimedia Commons has media related to The Beggar's Opera.